I'm working on a multi-lingual joomla 3.6 site and I'm running into a problem with the contact page. The issue I'm running into is how to internationalize the labels on the contact page corresponding to the active language menu. 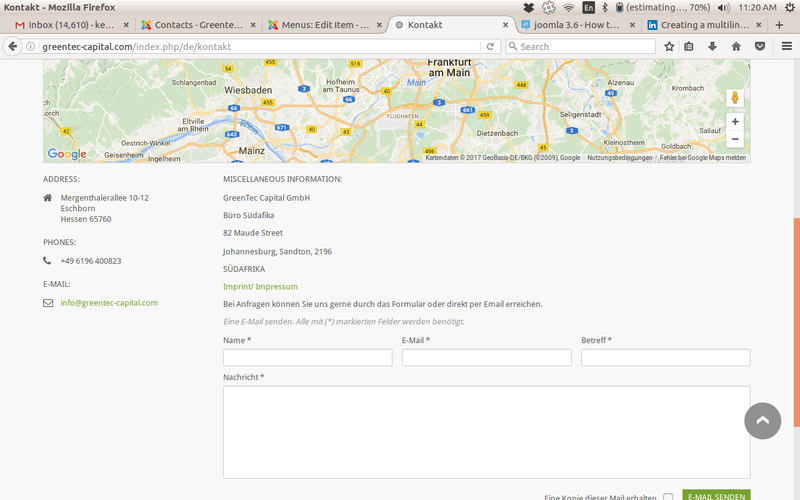 I'm using the core contact component, mapped to both the German and an English Menus. I want to show the same contact information, but with language appropriate labels for "Address" and "Miscellaneous Information" to the language appropriate equivalents. I have looked into creating a separate display layout, but it looks like the com_contact html files use hard-coded variables for the labels I want to change. I'm looking into Language Overrides, but I'm not sure how to limit them to pages on the German menu. The problem I have comes down to that not all of the content labels are translated. The Contact form is translated, but the labels for Address, Phones, and Miscellaneous Information remain in English. I guess my question comes down to how to I make language specific changes to those labels. Your additional language pack should contain your language's translations for the translatable strings of the labels. Simply create your GER and ENG contacts in the contact manager, in the same manner as you do for your other content. Create menu items in both your ENG / GER menus, set their language and select the corresponding contact. I just tested the de-DE language pack and the single contact menu item is translated. If you have done all of the required steps to produce a multi-lingual contact page but you still get english translations, then maybe check your template's html overrides, as it might ships with an override for the contact page that contains no Translatable strings. Not the answer you're looking for? Browse other questions tagged joomla-3.6 template-override multilingual translation contact or ask your own question. Is ordering broken for the Joomla 3 language selector? How to modify existing contact page? How to convert an existing site to multi-language? How to fix address not displaying on default com_contact page? Com_Contact strange behavior showing labels for empty contact fields, how to resolve? How can I insert email address to database who sent an email via contact form?